The search for a specialist sports car can be a tricky business, particularly if the car in question has been a bit of an obsession since childhood. That's when it's all too easy to let the heart rule the head  and this can have expensive consequences. 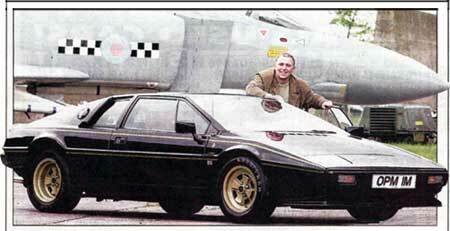 But Stewart Milne is a cool customer and had been taking his time looking out for his dream car, a Lotus Esprit. All that changed, however, when he saw the black 1979 JPS model and jumped at the chance to make it his. "The Esprit had been the car of my dreams since I was 14, so I just ended up buying it," he says. "It was the same model they used in one of the James Bond films, but that didn't stop a £3500 bill to get it through its MoT. "To make matters worse, any spare money that Stewart had around had been earmarked for a new bathroom. But that soon became water under the bridge and, despite pleas from his wife, he spent the money on a top end engine re-build, a new steering rack, new tyres and a paint job rather than splashing out on taps, sinks and a bath. "We ended up waiting a few years for the bathroom," admits Stewart, "but once you actually get behind the wheel of the car and drive it, there are no second thoughts." The Esprit has covered 80,000 miles and has had eight owners during its life  with Stewart at the helm for the last six years. Its first owner was Mick Fleetwood, the lead singer of Fleetwood Mac who bought it at the height of his success at the end of the 70s, and the car's still on song. 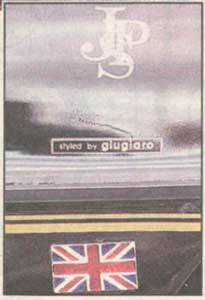 Under the bonnet is a 2-litre engine which, thanks to Lotus's 1970s Formula 1 technology, pumps out 160bhp. Combined with a light-weight fibreglass body-kit and an outstanding suspension system, the 23-year old car can hit 60mph in 6.5 seconds and, in theory, could reach a top speed of 138mph. The interior may be finished in red leather, but St Andrews-based Stewart reckons the engine noise leaves the driver in no doubt that it is a serious sports car. "You can approach a corner at virtually any speed and the car just stays flat through the bend," he says. "You do, however, have to be quite careful with the accelerator as you hit speed limits very, very quickly." Stewart may have learned the hard way about buying a car with his heart rather than his head, but he reckons that homework and advice are the best ways to avoid making expensive mistakes. 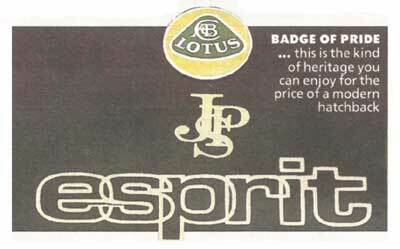 HE MAKES good use of Club Lotus, and their links with manufacturers of spare parts... which helps to keep the running costs of the Esprit down. He is also a member of Scottish Esprits (www.delands.fsnet.co.uk) which can give advice to anyone who owns an Esprit or is considering buying one. One of the big attractions of the Lotus for Stewart was that it was dream car that can cost a lot less than a new hatchback. He says: "I'm sure it would be nice to have a Ferrari or something like that but the Lotus hasn't cost enormous amounts of money to run. And it is such a fantastic feeling when you drive it. " My wife also really likes the car... but not when things go wrong with it."